This piece was first published on March 27, 2019. We’re bumping it today for the game’s release. Sweet and competent though they were, there was something missing from the earlier sidescrollers from longtime Nintendo partner studio Good-Feel, Yoshi’s Woolly World and Kirby’s Epic Yarn. Their presentation was faultless, with their knitted adversaries, sewn-together scenery and cute yarn gimmicks, but their design was conservative; after a couple of hours, you’d seen every new idea that they had. 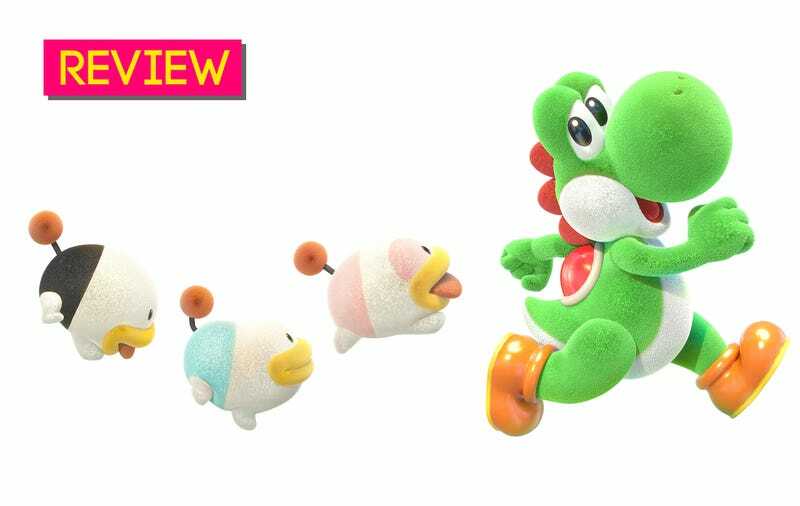 Good-Feel’s newest game with Nintendo, Yoshi’s Crafted World, combines that touchably gorgeous aesthetic with a game that feels more focused, memorable and varied. It’s a little more ambitious, but just as welcoming. Set around the same time as the first Yoshi’s Island, before the little dino became acquainted with baby Mario, it sends you on a gentle adventure, collecting gems and stopping a pint-sized Bowser from causing trouble. I got a kick out of watching baby Bowser push Kamek around with his toddler-ish demands. Before one boss battle, he whines for Kamek to build him a crocodile-train. Good-Feel has moved past the cuddleable fabric look here and gone for a more eclectic craftsy vibe, with cut-out cardboard cows and seagulls as scenic decoration and bosses made from tin cans and rubber gloves. There are creative visual details everywhere you look: plasticine penguins, origami frogs, forts built from candy boxes, polar bears made from upturned paper cups with drawn-on faces, concertina snakes. It’s more interesting than the saccharine stitched-together look of Woolly World; the variety draws the eye. It made me want to get a crafts box out and try to recreate some of it in real life, which, incidentally, would be totally feasible for artistically-minded kids. I’ve rarely played a game so appealingly beautiful. Little clusters of two or three levels are linked together on a papercraft map, each accompanied by crafted diorama scenes to admire before you get started. The themes are exactly the kind of thing you’d find in a primary school classroom: space, the circus, the jungle, pirates. Some favorite levels of mine: a ninja castle with sliding doors, corrugated pagodas and bamboo forests made of green straws, where Shy Guys throw shurikens made of cardboard and foil; a jungle where I spent most of my time running away from a little crafted rhino; a haunted house with secret rooms and ghosts suspended from string. It’s wonderfully tactile, and so much of it is interactive. Yoshi can throw eggs into the background and foreground of the scene now, knocking paper butterflies out of Shy Guys’ hands or bashing a painted bush aside to reveal a secret. The levels are densely packed with coins and flowers to ferret out, making this a game more about looking around and following your curiosity than running and jumping. Conquering a level is rarely challenging by itself. Yoshi’s generous health and flutter-jump make it unlikely that you’ll fail, and most enemies don’t bother to chase you. Shy Guys roam dopily about, minding their own business until Yoshi snags them with his tongue and turns them into eggs, like a monster. Instead the challenge comes from rinsing each level for all its secret hideaways, coins and collectibles, something that’s rarely possible the first time through. New levels are gated by how many flowers you’ve collected, rather than how many levels you’ve completed. Dash through without taking any time to look around and find things, and you’ll have to go back to have a closer look. Another interesting twist: once you’ve played a level you can play it again, only backwards, which charmingly exposes the unvarnished side of the crafted scenarios whilst you search for Poochie puppies hiding behind the scenery. You can see the tape on the back of the seagulls that attaches them to your strings, the props holding the building facades up, and the unpainted sides of all the decorative trees and mountains. This is a cute touch, and makes you appreciate the detail of these levels all the more. 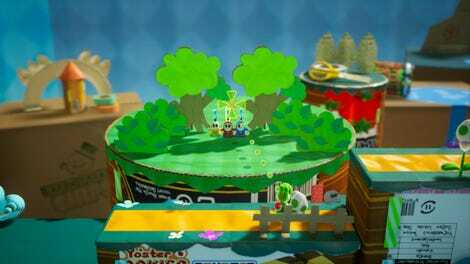 Yoshi’s Crafted World breaks up its levels with challenges that play like fairground games, in which you might hurl eggs at targets from a moving train, take control of a cardboard Yoshi robot with a spring-loaded boxing glove, or jump through hoops on a timer. These aren’t wildly original, but they are a lot of fun. My toddler adored the robot obstacle course, so I’ve now played it about 30 times. Speaking of kids, this is a game designed to delight children. It’s full of things that tiny tots adore, such as trains, animals, confectionary and dinosaurs. My son is only two, so I felt like I was appreciating the cute touches and crafted rhinos rather more than him, but even a child too young to pick up a controller would enjoy watching a parent play a few levels. Yoshi’s Crafted World includes Nintendo’s now-trademark 2D platformer co-op, letting you either collaborate with another competent player or carry a less skilled one through. It works fine, but I found there wasn’t quite enough room on-screen to accommodate two Yoshi’s comfortably. Playing with another adult, we were continuously jumping on each others’ heads or swallowing each other by accident. I didn’t feel compelled to rush through Yoshi’s Crafted World. I’ve been picking at it a couple of levels at a time, every time I need a little hit of sweetness in my day, which is often at the moment (have you SEEN the news?). It’s an imaginative game that’s effortlessly pleasing, perfectly suited to family play or as a train-journey stress-reliever. I’ve said it before, but it bears repeating: nobody does cute like Nintendo.